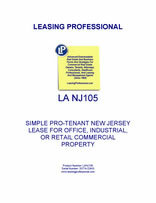 This form is for a single tenant New Jersey lease where the tenant has superior leverage. It gives the tenant the right to use the premises for "any legal use," and has very abbreviated remedies for the landlord in the event of a tenant default. It is also pro-tenant in character because of the clauses it does not contain which customarily appear in pro-landlord forms relating to remedies and a variety of other pro-landlord provisions. New Jersey is located to the southwest of New York and is home to both Rutgers and Princeton Universities. New Jersey has an important agricultural presence in farming potatoes, tomatoes and peaches, The State also produces chemicals and pharmaceuticals. Economically, the State is quite well off, with per capita personal income in 2004 in New Jersey the fourth highest in the nation.